A stylish eclectic apartment with contemporary furnishings and appliances offset against a tribal theme with textiles, chairs and stools from Ethiopia, African sculpture, textiles and a little flavour of Africa. Beautifully presented and recently refurbished ground floor 1 bedroom / studio apartment with fully equipped designer kitchen and luxury king size bed which can be separated to make comfortable twin single beds and additional roll out comfortable single futon chair. To keep things cozy the apartment has in floor heating, double glazing for an even temperature & noise reduction and leather lounge. To relax the apartment has a 37" High def LCD TV with digital tuner and DVD player. Complimentary welcome first morning light breakfast pack including Coffee, Tea, Cereal, milk and bread and spreads, as well as eggs from our free range heritage hens while they are laying, provided for the first night. To keep in touch free Wifi Broadband is available on request. The service is always available for standard email and browsing but is not suitable for gaming nor downloading large volumes. Facilities include a fully equipped kitchen, dishwasher, bath and hair dryer, on site laundry and one undercover car park. Portable cot and baby chair are also available on request. Toogooloowa 3 is superbly located at the quiet end of Davey Street with an easy 1.8 km walk down to the Hobart CBD, Salamanca and the waterfront or to the University of Tas. It is situated among the grand old heritage homes of upper Davey St just a short stroll along historic garden lined streets to South Hobart's shops and restaurants to the Cascade brewery and the Hobart Rivulet walk. This self contained apartment is the perfect home away from home. Suitable for short or longer stays all at a very reasonable tariff. If you are considering a sea-change and moving to Tasmania or visiting UTAS for a summer school or semester special arrangements can be made for longer stays. This apartment occupies the ground floor of the stables in the grounds of Toogoolowa a beautiful heritage listed Victorian mansion which surrounds the original colonial 2 room cottage built as the first dwelling in the area during the early 1800s and the Georgian extension that was built over and around the cottage some years later. Visitors are welcome to smell the roses, share and relax in the huge wild garden with splendid views to Mount Wellington at the rear of Toogooloowa. Met by John who was very friendly and it just kept on as enjoyment from there on. Quiet but still virtually in the city. Handy location although difficult to find the Street Number as we had to drive around the street several times to find this place. Honestly wasn't impressed. Got there hard to find the entrance cause of all the overgrown garden. Parking wasn't the best as the shed was to low to park our car in. The untensils weren't clean. The bath was quiet small overall what you see on the site is not what you get in person, however will say friendly service, but did not receive our fresh eggs you weren't meant to have. The appartment was just perfect for my needs. It's spacious, well appointed and clean. The view to kunanyi/ mt Wellington was beautiful and ever changing, the rambling garden was a perfect spot for an afternoon coffee and made it feel more like a rural escape than a near city appartment. The location is a comfortable stroll into the CBD or Salamanca and has heaps of parking too if that's your thing. 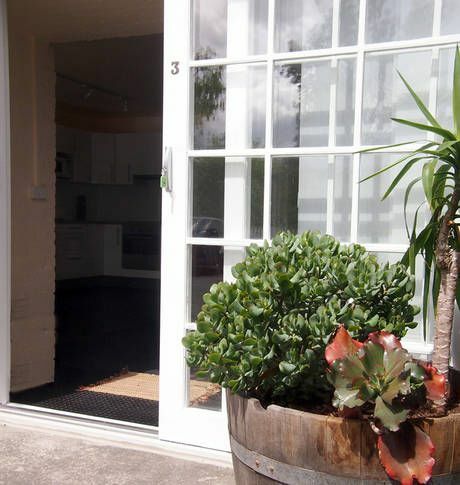 This clean, well appointed but simple appartment was everything I needed for a comfortable stay while working in Hobart and represents excellent value too. Great accomodation, with a farm yard feel outside, would be amazing with a little weeding and a garden tidy up, the chickens are beautiful and eggs.....,yum!! !